The 10th annual Gorge Ride is just around the corner! Enjoy the beautiful views as you ride along the historic highway along The Gorge. The tenth annual Gorge Ride sponsored by the Friends of the Historic Columbia River Highway (FHCRH) will be held Saturday, June 18, 2016, beginning at the Gorge Discovery Center. The ride extends 19.25 miles along the historic highway and state trail west to the Senator Mark O. Hatfield West Trailhead, just east of Hood River, and then returns. The course opens at 7am, and closes at 4pm. Sack lunch from Basalt Rock Café at the Gorge Discovery Center available for purchase during online registration for $14. Hi-tech Male & Female version souvenir t-shirts may be ordered for $25/each ‘til 11:59 PM 6/8/2016. 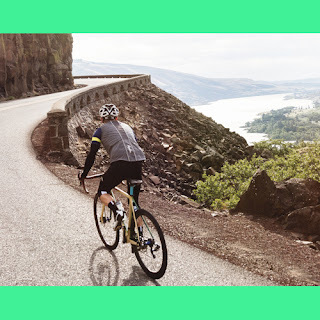 The route is a combination of historic highway open to motor vehicles (with very low traffic) and the Historic Columbia River Highway State Trail (open only to pedestrian and bicyclists). The out and back route is a total of 38.5 miles. Experience the panoramic view at Rowena Crest. Visit the grounds of the historic Mayerdale Estate. Travel through the restored Mosier Twin Tunnels. The ride is fully supported with water stops, snacks, mechanical support, and SAG wagons. Maps with cue sheets and an elevation chart are provided. A sack lunch from the Basalt Rock Café, within the Gorge Discovery Center, will be available for purchase during on-line registration. T-shirts featuring a Gorge Ride graphic will also be available for purchase during on-line registration only. Packet pickup will be at the Gorge Discovery Center on June 18 from 7 AM to 10 AM. Course opens at 7 AM and closes at 4 PM. Participants will be required to sign our waiver and release form at packet pickup. Riders under 18 years-of-age must be accompanied on the ride by a registered adult and their waiver and release form must be signed by a parent or legal guardian. Participants must wear a CPSC/ASTM/ANSI/Snell approved helmet. The terrain really isn’t as tough as it looks on the above elevation profile — the HCRH was built with no grades exceeding 5%. Folks of all ages & physical condition have ridden it. When you encounter a hill, just ‘gear down’, take it one pedal stroke at a time, and remember that it’s taking you to a view even nicer than the ones on the way up! Online registration is the only advance registration method.